Well thanks to my son’s unfortunate ear infection last week, I was able to find that sixth grade yesterday to return his book. Whew! Graceling is a wonderful first novel by Kristen Cashore!. The main character Katsa is a gutsy, determined and fierce female fighter who has been able to kill men with her bare hands since she was child. The title of the book references special people like Katsa who are born with “graces”, or special talents, and two differently colored eyes. In Katsa’s case, she has one blue and one green, while Po, another important character has one gold and one silver. Some Gracelings have pretty ordinary powers, and some Graces are not quite what they first appear to be. In both Katsa’s and Po’s case, their original Grace does not end up being what saves many a life by the end of the book. The action is suspenseful and the notion of a “Grace” is unique enough to really keep the reader guessing. I was surprised to find a small romance part to the book, just because it came recommended from a young male student. I decided those parts probably went right over his head. There has been a lot of great buzz around Graceling and I had planned on reading it over the summer. Not only do I need to thank my former students for asking me to read the book, but now I have to thank him for making me have to wait until October to read Cashore’s second book, Fire. I did get to surprise him with the news of its upcoming publication, which is always fun for me! It was such a nice change to have a student following up with me about my reading instead of the other way around. It did help me see that a little encouragement can go a long way when it comes to getting someone to read. I wonder who I should go peddle this book to next? Anyone have an ARC of Fire that they’d like me to read and review? Send it my way! I do take a strange pleasure/pride in being able to recommend a book to a child or teen. Last month at book club, a friend mentioned that her seventh grader was having a hard time finding something to read. I offered to send home a couple of books I had picked up at NCTE and jokingly said that all her daughter had to do was to write a review for the blog if she wanted to read them. Imagine my delight when she returned the books last night, complete with reviews. What follows today and tomorrow are the reviews of two Tamora Pierce books by Amelia, aged 12. This is a book of daring and secrecy. A girl and her twin brother switch places and the girl, Alanna, heads off to the castle disguised as a boy. At the castle, Alanna must go through the challenges of being a page: the work, the people, and the fact that she is exposed to a completely new world. She also has to hide from her friends and teachers that she is a girl, a task that grows harder as she grows older. Along the way, Alanna befriends the King of Thieves, Prince Jonathan, and Sir Myles, a knight. She inadvertently creates an enemy in a fellow page, causing her to encounter difficulties. She realizes she needs to overcome her fear and discover a way to help herself. During her first two years as a page, Alanna learns that her friends will stick with you no matter what, and that just because she is different they will not dislike or leave her. This books was a quick and easy read but it was very enjoyable. Although it was quick, I felt that it was well written. It was interesting beacuse it was about a girl instead of a boy. Since it touches on the topic of puberty, I don’t know if it would be appropriate for Intermediate School, but it should be appropriate for Middle School. Well said, and thanks to Amelia! 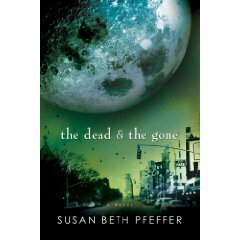 the dead & the gone is a great read! I put sequel in quotation marks, because it is not necessary to have read Life As We Knew It first. You could read each book independently or in either order. I found dead & the gone to be very gripping and liked the pace of the book. The book is set in New York City and the main character is a teenage boy by the name of Alex. Alex’s mother is at work and his father has returned to Puerto Rico for a funeral when the moon is pushed out of orbit by an asteroid. Suddenly he is in charge of two younger sisters and having to worry about where they will get their next meal. The lengths he must go to keep his remaining family safe are great. I do feel Life As We Knew It Was a slightly stronger book overall, but the dead & the gone is definitely worth reading and sharing with YA students. 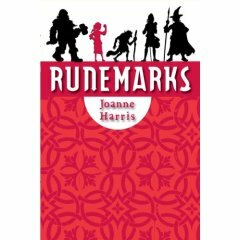 I actually started listening to Runemarksby Joanne Harris last April in what used to be a short commute to my school. I find audio books to be a relaxing way to clear my mind in between the craziness of mornings with young children and the time crunch to get to school. The audio book does have 14 discs (I love the voice they have reading the book) so I didn’t get it done before the school year ended. I finally finished with the start of my new job (I’m in the car more than I have ever been-I used to have a 10 minute commute from home to the school). The main character Maddie is a young girl in what could be a village in the future or in the past (yeah fantasy genre!). She is very isolated and unaccepted by everyone, including her own father and sister, due to a mark (runemark) she was born with on her hand. She has some unusual talents (think magical) that keep the other villagers viewing her as suspect. Things never go quite as she had planned and Maddie does not really have any one person to stand up for her. She finally makes friends with a traveler named One-Eye, who comes through her village once a year. It is through her relationship with One-Eye that Maddie finds an escape from her horrid treatment by the villagers. Dreams and any kind of thinking for yourself are forbidden by the people who rule the community and a conflict rises again between those “marked” or chosen and those who have “The Word” (think Inquisition from history). Adventure and danger, an epic battle, and well defined characters keep drawing me back in when on occassion I was deterred by the length of the overall book or a few slightly slower passages. I think this book would be best appreciated by middle student students on up who have the background knowledge about mythology and Norse gods. That background knowledge should really help make this book a new favorite with the YA group.